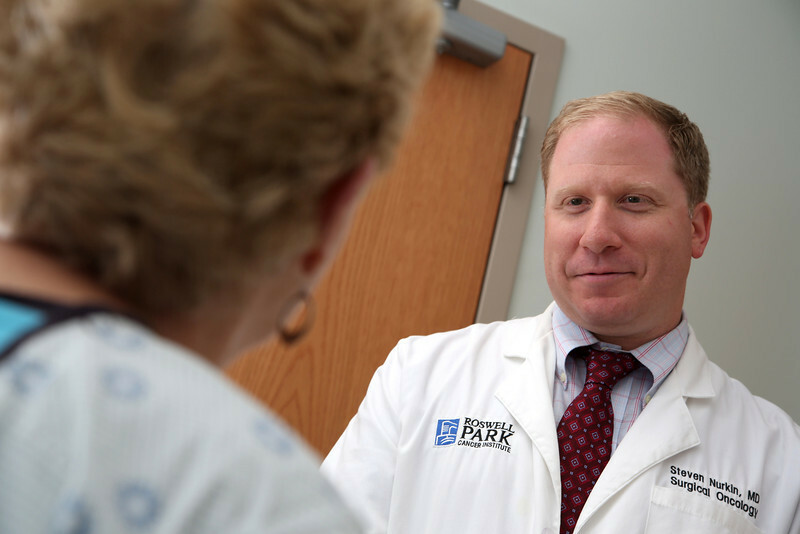 Our Gastrointestinal Surgery program offers many modalities to provide individualized, tailored treatment for our patients with colorectal cancer. As outpatient procedures, Endoscopic Mucosal Resection (EMR) and Endoscopic Submucosal Dissection (ESD) can remove colorectal polyps and even low-risk superficial cancers with curative intent. These patients can often avoid a major operation and its associated morbidity. Similarly, Transanal Endoscopic Microsurgery (TEM) utilizes a long proctoscope accompanied with high definition optics, insufflation and specialized instruments to remove large, mid and upper rectal polyps and superficial cancers with a transanal approach. This involves an overnight hospital stay procedure and can often be combined with chemoradiation for patients that are not candidates for proctectomy. For more advanced tumors, our expertise in laparoscopic and robotic surgery offers patients smaller incisions, less pain and a faster recovery. When feasible, we use nerve-sparing techniques to preserve urinary and sexual function, and can often spare the sphincters — avoiding the need of a permanent bag (colostomy). In addition to these techniques, there are new management strategies for select patients with colorectal cancer. First, nonoperative management is an exciting new strategy that we offer to patients with locally advanced rectal cancer. It involves an aggressive surveillance program for patients that have achieved a complete clinical response (tumor disappears) after neoadjuvant therapy for their tumor. Although long-term results are limited, short-term outcomes are very promising. In addition, we have recently opened the PROSPECT trial (National Alliance Group), looking to see if neoadjuvant radiation can be avoided in select patients with rectal cancer. In conclusion, GI Surgery at Roswell Park emphasizes the importance of personalized patient care by providing treatment options appropriate for the individual and the disease. We believe that preventing and treating cancer is a team effort. We emphasize this integrated approach and work closely with specialists in medical oncology and radiation oncology, as well as others including genetic counselors, social workers and mental/emotional and physical health services. Members of this team discuss individual patients at our weekly multidisciplinary conferences to make sure that we can provide the most comprehensive care possible.